Fropper operates with two separate entrance points. People "frop" or hop around one site in search of friendship. Fropper's meaning is short for friend hopper, according to the company. Those who seek a love interest click on the Fropper name at the top. 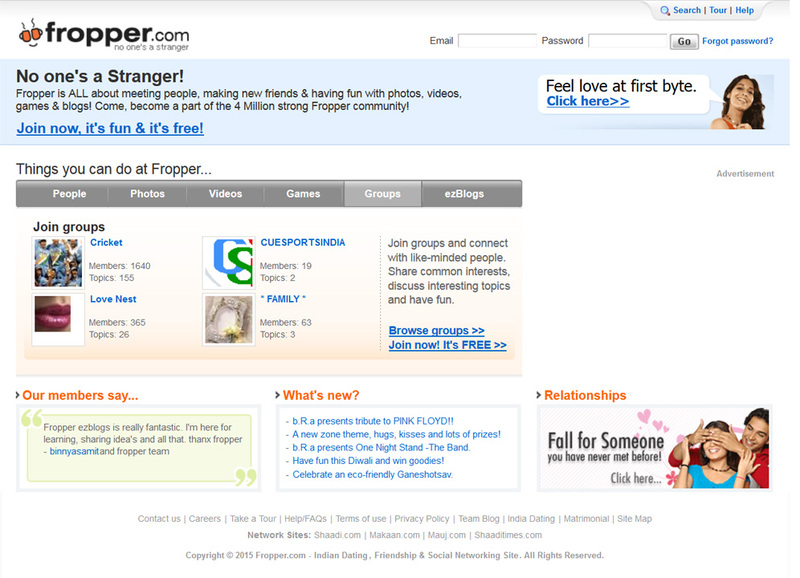 Visitors can then register on their sister site, "Fropper Relationships." Fropper users are also able to post and manage their profiles and upload and add photos for free. 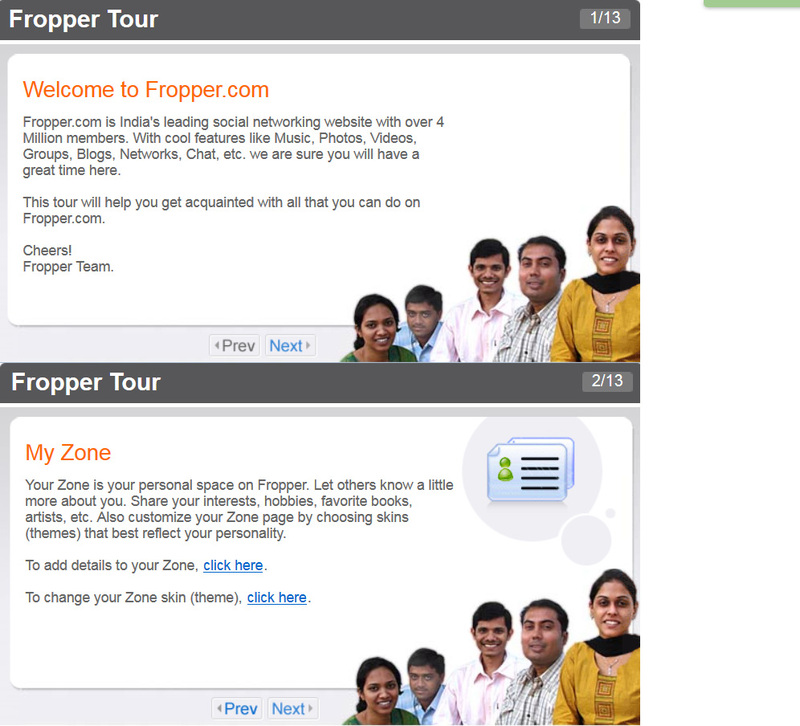 Each participant has a personal home page called, My Fropper. This section is where members can view how many views they have received, who contacted them, and more. In addition, there is a My Favorites folder where singles can include favorite profiles they have viewed. To date, all these services are free as well. One of the drawbacks to having a free account is that free members can chat with premium members, but they can't chat with one another. But if friendship is all you want, Fropper users can create a Zone to express themselves through blogging, chatting, joining a group, and more. There are a variety of communication tools. Friends are able to chat, play games, browse zones, send and receive buzzes. These buzz alerts let members know of their interest in one another at the site. Visitors have shared that Fropper's interface is easy to use and the website's load time was quick. What makes this site different than most is that on the front page you are able to click on tabs that lead to various areas of the site rather than finding out later after clicking on a few page. Some of the features include: you can see who's online, set up your profile, chat, search, check out birthdays today, and more. When searching for a potential friend, you can do so by gender, age, city search, preferred relationship, country, and cities. Your searches can be saved which is a plus. You can then go back later and follow up with each. If you prefer to view only profiles with photos, you can check a box available on the site. All of this can be accessed via Fropper's front page, so you have a good idea what the website is like before you join. Many other dating sites don't permit you to see so much like Fropper does until you register. This was definitely impressive! If you are interested in finding a "Perfect Match," Fropper supplies this service to premium members so that they can better connect with others who fit their profile descriptions. A questionnaire is filled out and matches are made based on preferences and similar interests. Fropper does enforce the Terms and Conditions of their site such as, inappropriate photos and images. Fropper does not permit adult content. Some users learned their own profiles had been changed or edited by Fropper staff. Others had their material removed or account terminated. Fropper staff pays close attention to how often emails are sent between members within a 24 hour period as well, according to a user. If there is any questionable content, they will hold the e-mail until it is approved. Some members also shared their concerns about slow response time from customer service. They were also displeased with many profiles that they described as "fake." Other former members had the same complaints. They shared how the quality of men is not very good and mentioned how some of the women have been on the site for years. In general, the website is one of the best because of many freebies it offers. The company seems to maintain the websites quite well. People appear to be enjoying themselves on the site. So if you are open to the possibility of making new friends from India, this site might be right for you!